"There is no Doubt, However, that UFOs are Real"
The recent column, “Chimps, humans, and ET,” generated some interesting comments from readers. 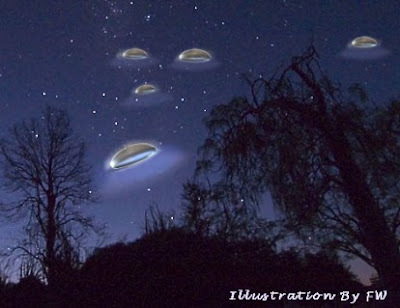 Several readers forwarded news articles and YouTube clips ‘proving’ the existence of extraterrestrials on earth. Worldwide, UFO enthusiasts are a mixed bag of serious researchers, disturbed individuals, and con artists. There are those who believe an alien invasion is imminent. There are those who state categorically that they have been ‘processed’ by aliens and subjected to physical examinations. Others claim that they have been part of a forced breeding program to create alien-human hybrids. However outlandish these stories may be, for the most part these people are dead serious. Yet these stories are mostly anecdotal accounts and are unsupported by physical evidence. Without physical evidence it is impossible to prove or disprove them. There is no doubt, however, that UFOs are real. When I was 10-years old, I noticed a very bright object in the late evening sky. It shown brightly and remained in a fixed position. It was much brighter than the planet Venus, which would have been the logical explanation. As dusk settled, it began to slowly move. I went into the house and tried to get the adults to come outside and look at it, but they were too busy playing cards. When I went back outside, the object had taken off, leaving a meandering reddish glowing trail painted brightly across the evening sky. It was not a planet or airplane. It might have been a weather balloon, but to my knowledge weather balloons do not leave trails. The point is I don’t know what it was, but that doesn’t mean it was an alien spacecraft or a divine creation. Every period of human history has a ‘fall back’ position for the unexplained. For most of human history that ‘gap’ in knowledge has been filled by a divine presence, i.e. God or gods. Gods have always been the placeholders for our ignorance of natural phenomenon. Gradually, as the discoveries of science have cast light in the darkness, these placeholders have lost their relevance. So the hundreds of human-invented gods for all the natural forces and human emotions have dissipated under the gradual onslaught of discovered facts. Some will say we no longer need a ‘God of gaps’ and that eventually science will fill in all the remaining missing pieces. . . . I do believe,but don't think they want war with us. I do believe that they don't want us to blow the World up. I also think maybe they have come from a different time than us, and could be us..